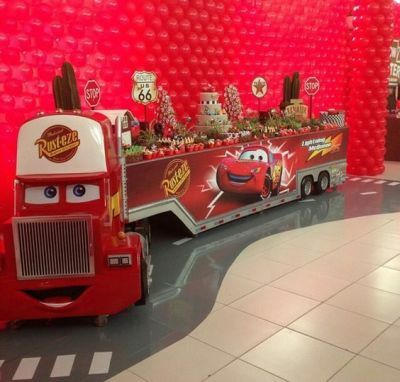 A Disney Cars birthday party or Cars 2 theme featuring Lightning McQueen, Mater and the gang is a winning idea. 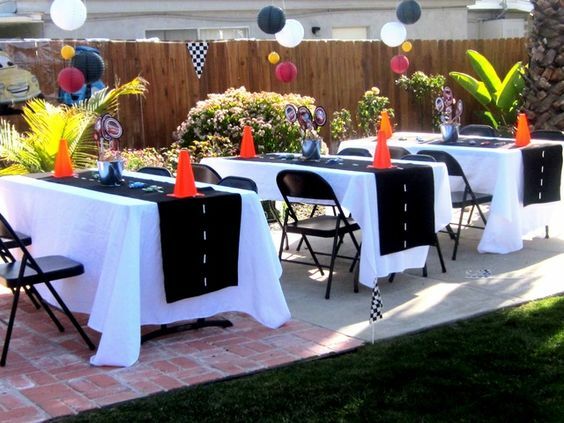 You don't need to be a pro for a first place finish with the party ideas found here. 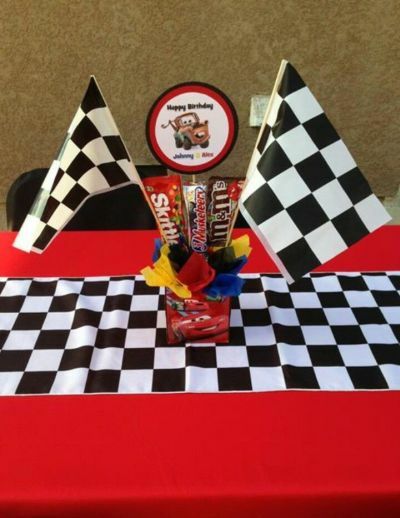 Start your engines with Cars themed invitations, fast paced decorations, and revved up party favors. 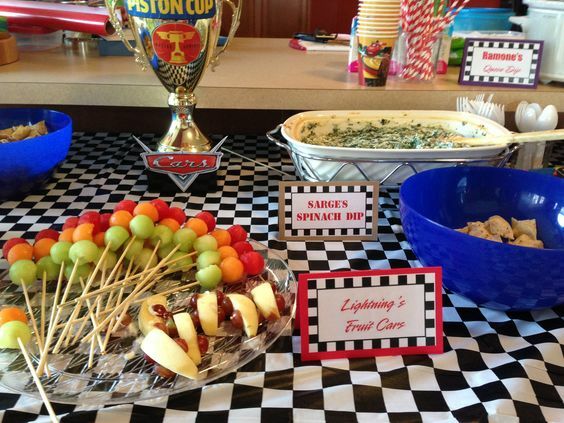 Seeing is believing, so enjoy photographs of racing inspired party snacks that the kids will love and you will do a double-take. From the drop of the green flag until the checkers fly, we have everything you need to celebrate race day. See you in the winner's circle. 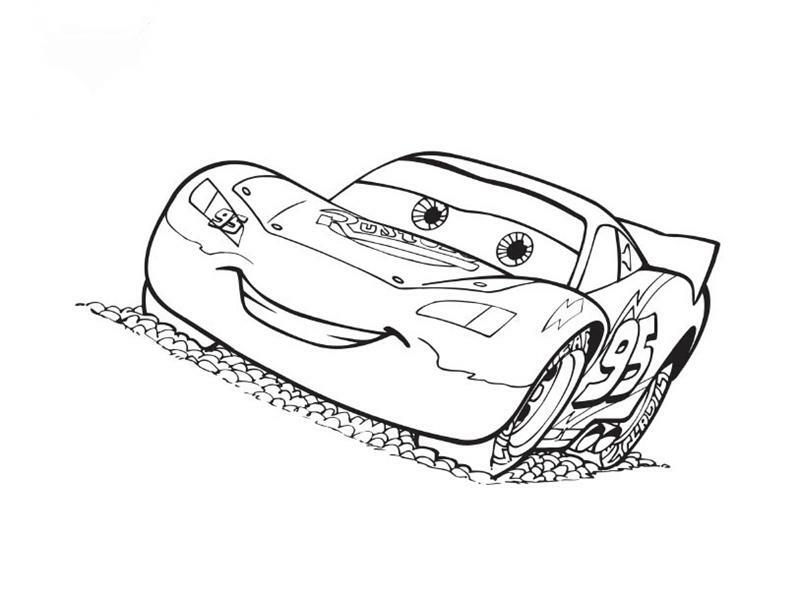 The story behind Lightning McQueen is his learning to slow down and to enjoy life, the journey is the reward. Without a doubt, that same attitude applies to planning a kids birthday party. It's never one thing that makes a party great, it's the culmination of favorite party ideas that brings the theme to life. 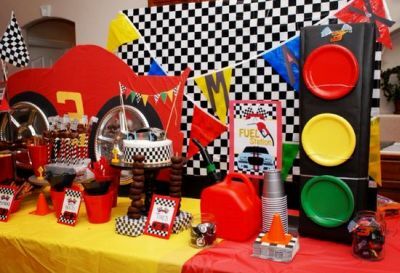 Let's go racing with Disney Cars birthday party ideas. "Ka-Chow!" as Lightning McQueen would say. Turn your backyard into a party space. Set the scene with table placements that welcome guests and finishing touches that can be anything from colorful paper lanterns to orange traffic cones. 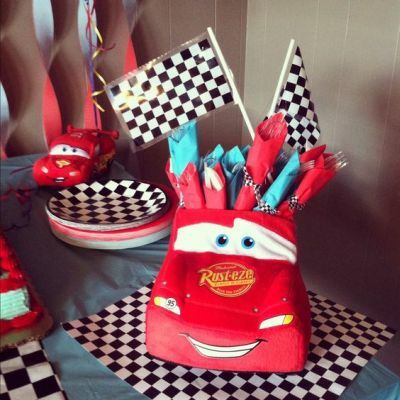 Let the Disney Cars birthday party theme speak for itself. Wow guests by creating a grand presentation with Mack pulling the party load. Guaranteed to impress. 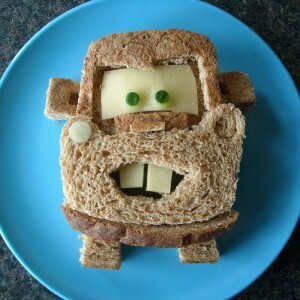 "My name's Mater...Yeah, like tuh-mater, but without the tuh." 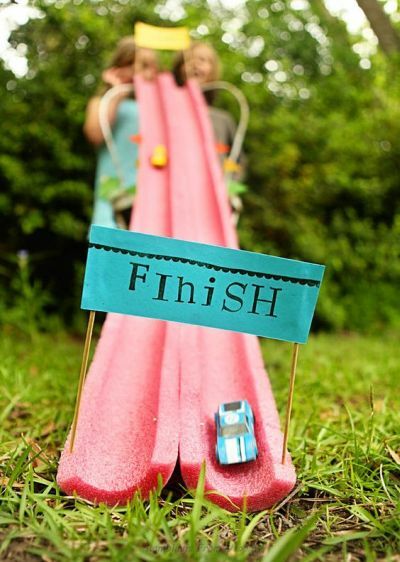 Test the speed of your little guests reactions with this impressive decorating idea. Kids will feel the thrill of seeing their friend, Tow Mater, the trustiest tow truck in Radiator Springs. 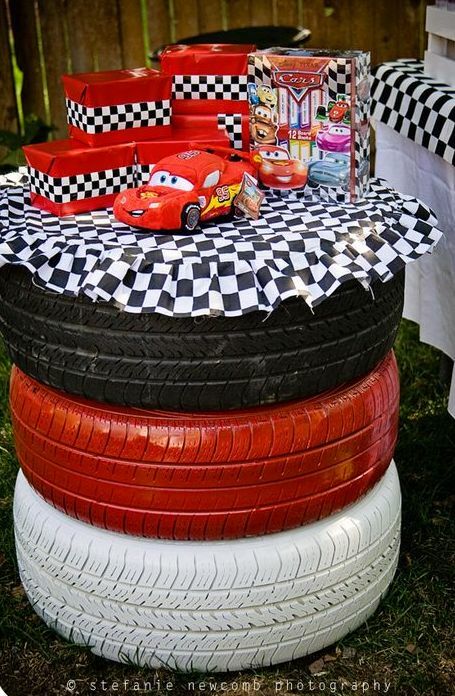 The intention in decorating a tabletop is to provide the right atmosphere for a Disney Cars birthday. 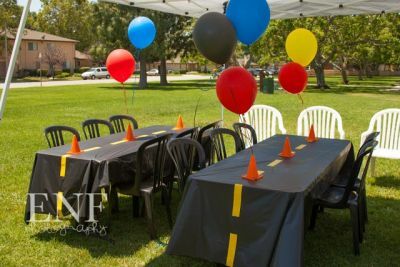 Here, black tablecloths are striped to represent the track, while balloons float from traffic cones. 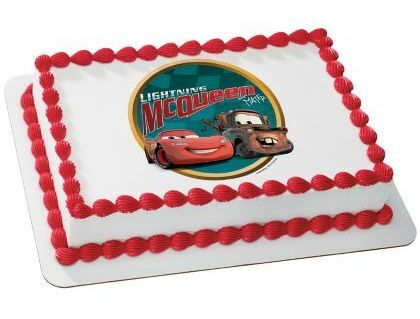 Get your Cars party off on the right track with Lightning McQueen, Raoul CaRoule, and Shu Todoroki setting the theme. 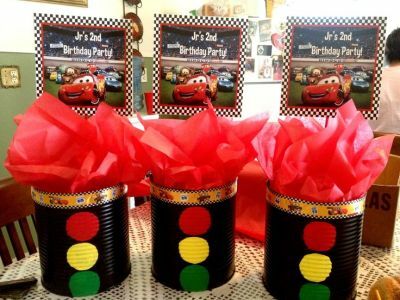 These Disney Cars birthday party invitations will provide the needed party details. All of your child's friends will be racing over for a good time. This edgy and energetic design provides the perfect opportunity to go all out with color. 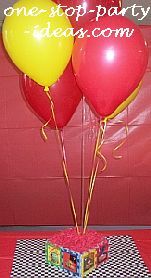 Here, bold red and yellow pops against a checkered backdrop, with lots of fun decorative elements worked in everywhere. We love the idea of using a red, yellow, and green paper plate to make a traffic light. 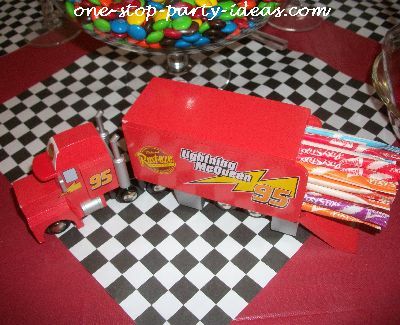 When Lightning McQueen races in with the cutlery, kids notice. Wrapping utensils is a decorative way to dress up needed party supplies. Pre-party assembly makes this a race winning idea. 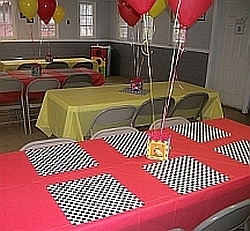 These tables are covered with red and yellow tablecloths with black and white checkered paper used as chargers for each pit crew member. The Disney Cars birthday party plates, cups, and napkins zoomed in to finish the tables. Race ready and waiting for little racers. Let's face it, kids love balloons. So, what better way to spruce up centerpieces at a kids birthday party. The containers were crafted from interlocking foam pieces filled with shredded paper. Also, consider marking the party zone with balloons hanging in the main party area or tying a bouquet to the mailbox. 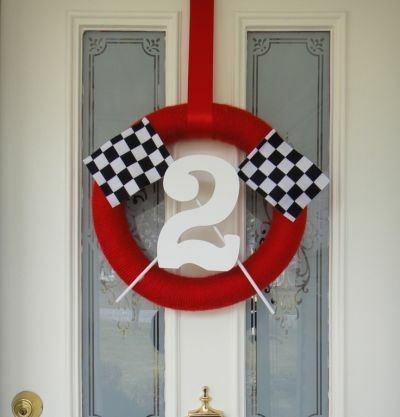 This wreath is a winning way to brighten your door and pay tribute to the theme. 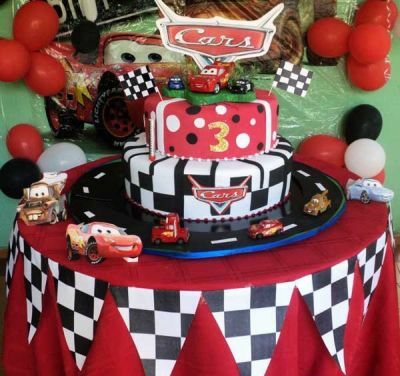 Make no mistake, Cars is the theme and someone is turning two. A coffee can makes a unique container, especially when you use it to take advantage of the theme. These repurposed coffee cans make impressive traffic lights with a little paint, decorative trim, and tissue paper. Perfect for the diy, green-decorating enthusiast. A checkered flag is so important and catches the attention of racers and fans alike. 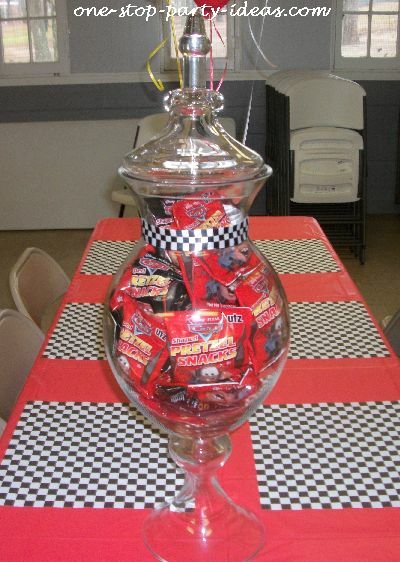 This tabletop makes the most of it, with a checkered table runner and centerpieces with the checkers flying high. 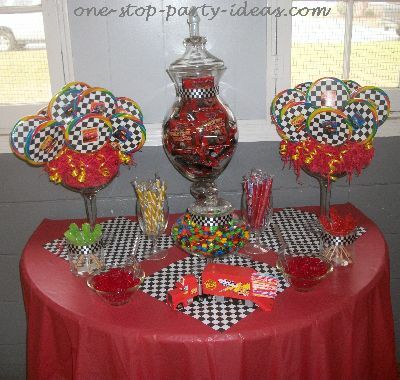 Including candy as part of the decoration is a sweet thing to do. There are plenty of ways to celebrate with balloons. 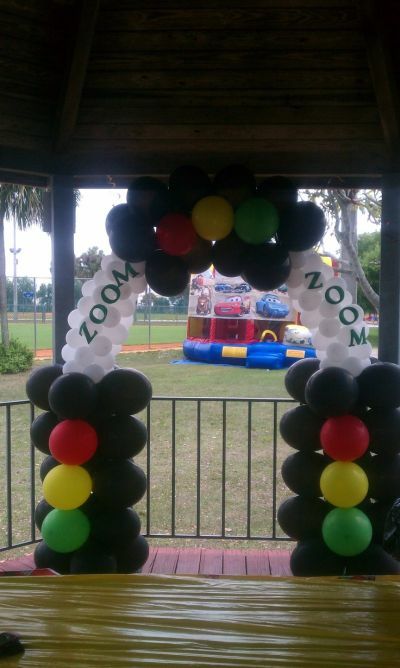 This extravagant balloon display boldly contrasts colors to make a big statement. It can be placed anywhere you like, even outside. 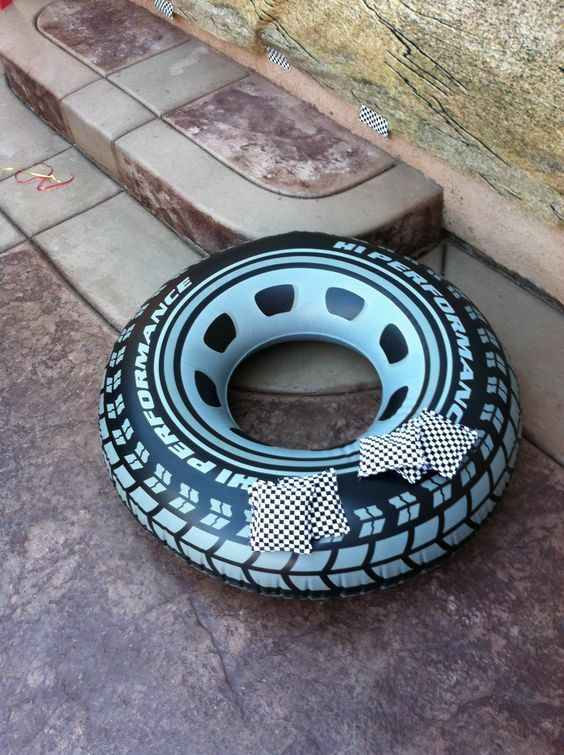 These tires were quickly changed into party decor. 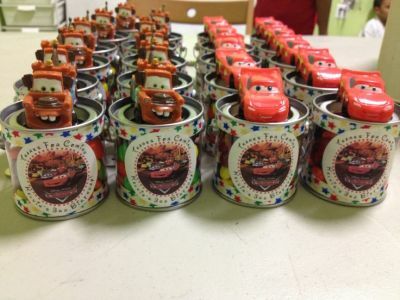 Painted in appropriate colors and stacked, they form the base for more Disney Cars birthday party accents. 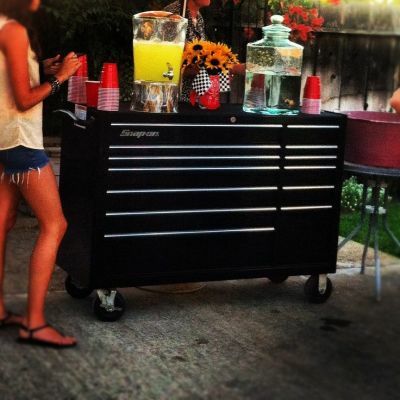 When thirsty little guests come down pit road, be ready with the perfect set up. Here, the presentation is an eye-catching one, thanks to a checkered table design that is full throttle. Keeping the beverages organized and easy for guests to serve themselves is a good idea. This tool box keeps everything needed in one place, while guests enjoy a refreshing decorating idea. Drenched with the theme. 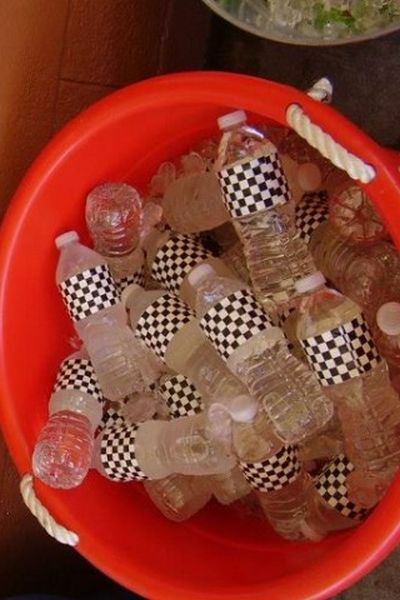 Checkered duct tape adds a customized look to water bottles that is simple and inexpensive to do. The bright red tub is a practical way to keep the drinks cold. Break out the smiles with a staged photo shoot. 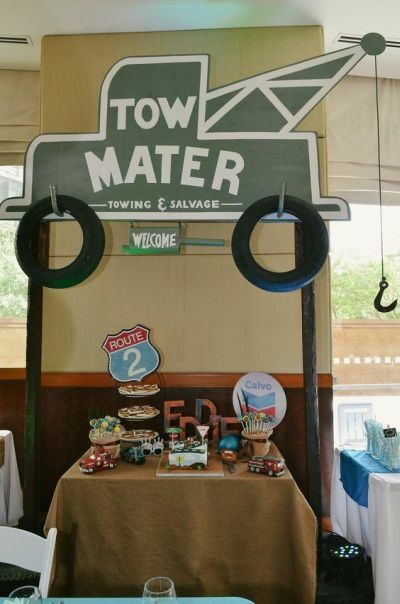 Using theme inspired props, individual and group pictures shot here will capture all the fun. 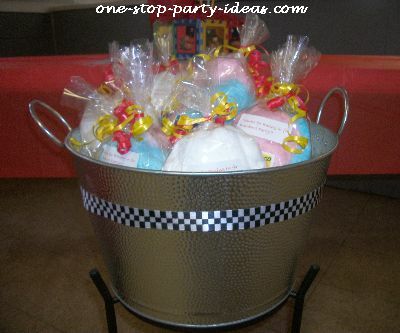 A Disney Cars birthday candy buffet is the perfect way to let kids create their own party favors. It is not every day that a child is faced with yummy candies and the freedom to fill a bag to their liking. 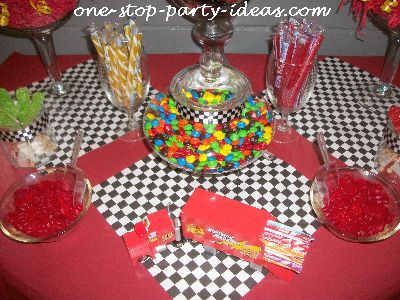 We would like to share our candy bar created for Brenden's 2nd birthday party. This candy buffet was our opportunity to go all out with the theme. Even though candy is appealing on its own, a touch of the checkered print scattered throughout tied it all together. A closer look. 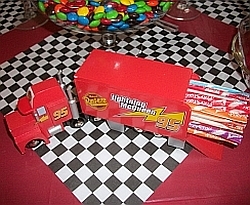 . .
Mack was elated to haul the Pixy Stix to the party and proudly parked at the head of the candy buffet. A large glass container flanked by others of various heights and sizes anchored the display. With a checkered ribbon attached, the candies inside are clearly seen. This lollipop arrangement was displayed on either side of the tall, large container. 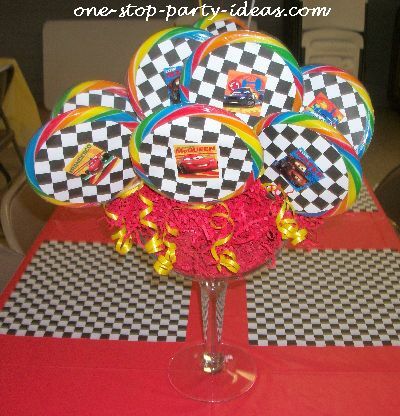 A circle of checkered cardstock was attached to the front of each lollipop and a Cars 2 sticker applied. Curly yellow ribbon was the finishing touch. The lollipops were then placed into a margarita glass that contained a ball of Styrofoam covered with red shredded paper. Gummy bears, rock candy, M&Ms, Pixy Stix, red candy sticks, yellow candy sticks, and pre-packaged Cars candy were used in our buffet, but any colorful candies will work. Scoops were provided for easy serving and clear plastic bags brought it all home. 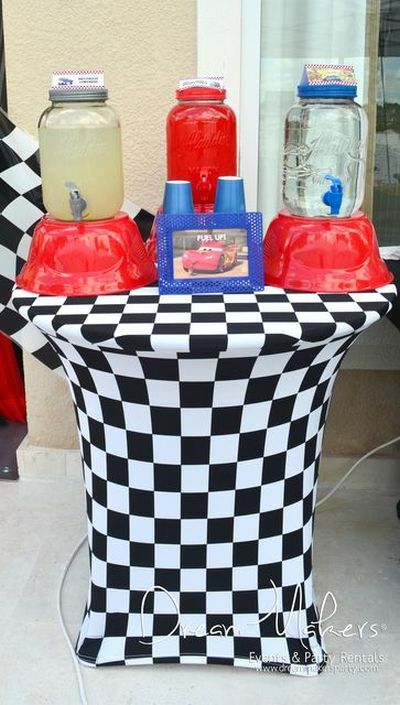 A beverage stand accented with a checkered flag ribbon served as the last pit stop. Filled with treat bags and placed near the door, the children helped themselves to a party favor on the way out. Explore the beverage stand possibilities. . .
And the trophy goes to. . .everyone. At the end of your party race, it's time to celebrate the victory with party favors. 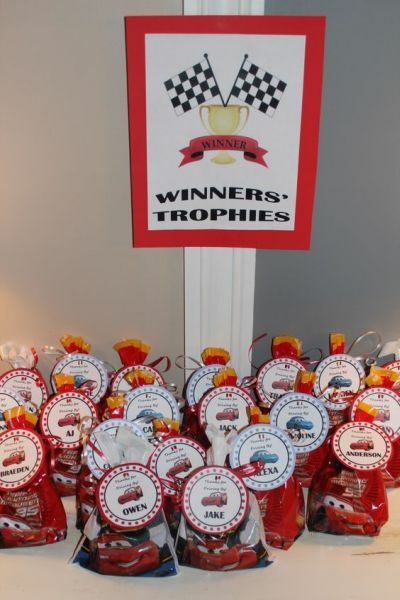 Shiny trophies filled with treats are the perfect reward for winning guests. Lightning and Mater can help. Grab and go. An alternative to treat bags or boxes, these adorable paint-can styled containers are filled with treats. And, as usual Lightning and Mater are coming out on top. It is much more fun to pretend when you have all the equipment. These personalized racing helmets will have little guests ready to start their engines. Rev up your favor presentation with a winning sign. 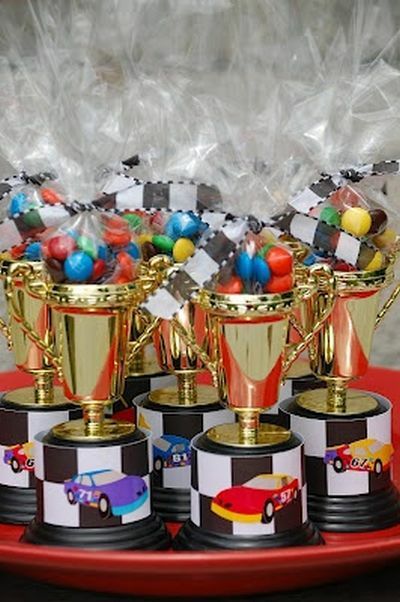 Favors could include Pez Disney Cars, stickers, jump ropes, yo-yos, tattoos, bubbles, pencils, toy cars, rubber bracelets, racing trophies, or other goodies. Shoot! Favor bags complements of the world's best backwards driver. 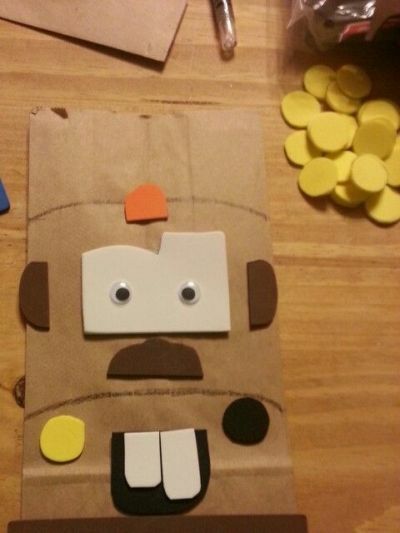 Tow Mater favor bags are an easy diy project or a fun crafting activity for kids. Plan early in the party, so that the decorations have time to dry, ready to go home filled with treats. Here, Lightning McQueen appears to pose for the cameras. The checkered pattern cinches the theme, allowing the rest of the cake to be artfully presented ready for the winner's circle. Since the cake is the star, surround it with spectacular decorative elements. 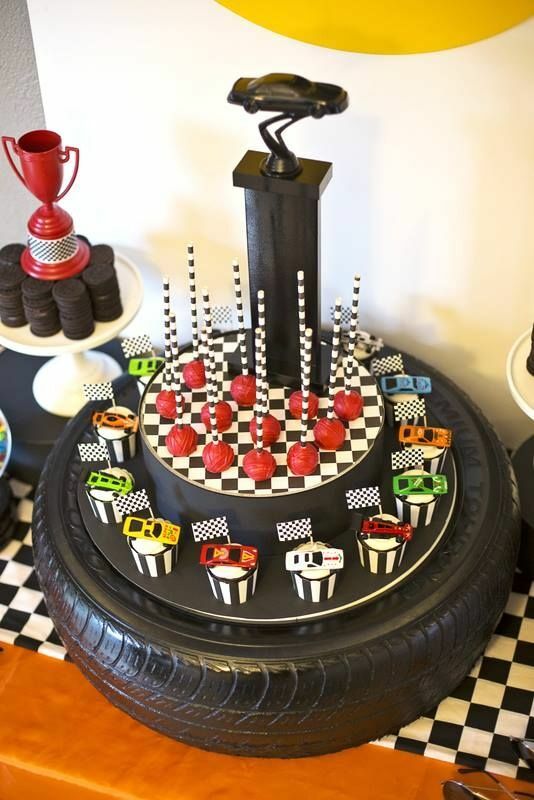 Everything about this cake presentation is a visual spectacle, from the race cars circling the track to the checkered pennant banner attached to the table. The more creative the presentation, the more your cake will be noticed. 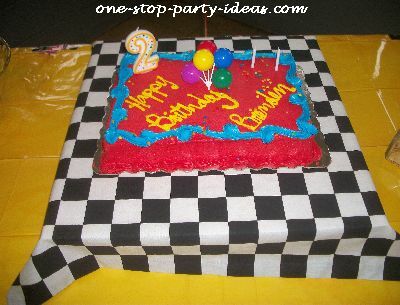 This birthday cake was placed on top of a small box covered with a checkered flag. A quick and easy trick to call attention to the cake. This presentation takes the first place trophy for originality. Here, a tire is practically effortless to use and works tirelessly to serve cupcakes with the thrill of victory. 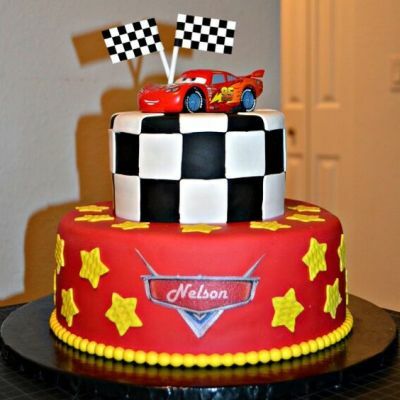 Bake your own cake and use the Disney Cars edible icing cake toppers. This topper comes with instructions and is ready to apply. 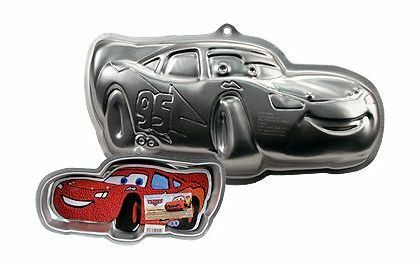 Use the Disney Cars cake pan of Lightning to bake your child's cake. Comes with easy to follow decorating instructions. 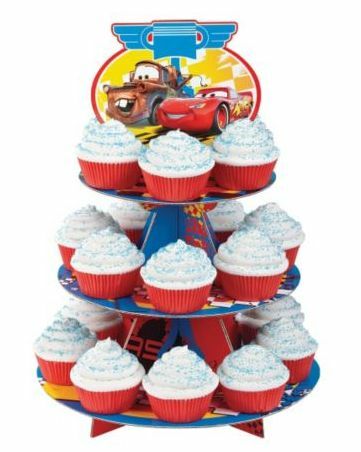 Go the extra mile with homemade cupcakes decorated in the Disney Cars birthday party theme. Short on time? Serve red and yellow cupcakes with sprinkles to coordinate with the theme. Tasty nod to the theme. 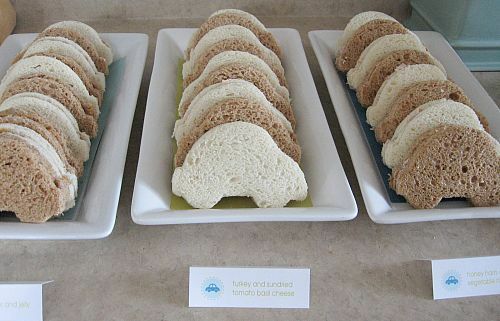 Turn basic sandwiches into something more appealing that kids easily recognize. Kids will run right through these traffic lights. 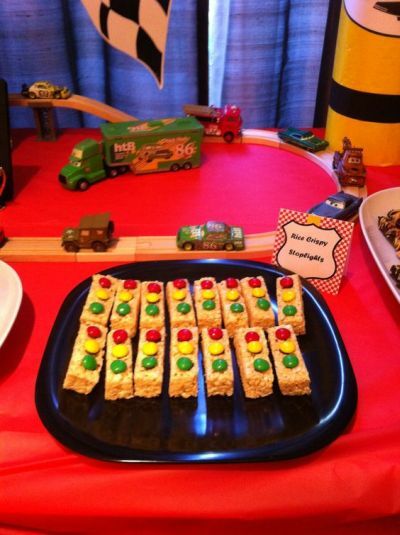 Simply, prepare rice cereal mixture, cut, and add red, yellow, and green candies for a fast Disney Cars birthday snack. Traffic light fruit kabobs instantly change kids minds about a healthy snack. Circling the skewers are colorful, delicious melon balls in red, yellow, and green. A light snack is a good food idea since kids typically eat less when they are excited. Mater knew he made a good choice in picking Lightning as his best friend. 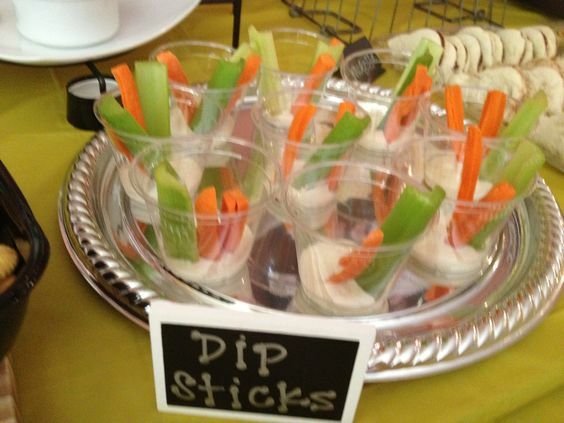 You can make a good choice too with these veggie dip sticks-delicious, portable, and most of all kids can enjoy the dipping all by themselves. 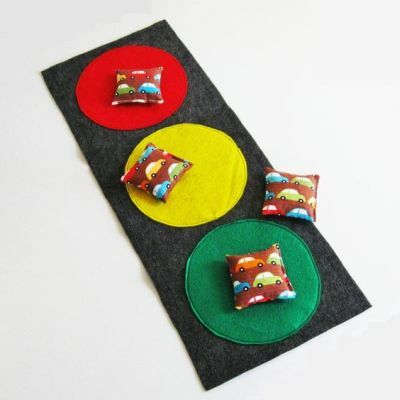 Traffic light bean bag toss. Three holes were cut into a large cardboard box covered with white paper. Crumpled red, yellow, and green crepe paper was glued to the box to resemble a traffic light. 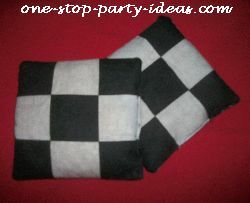 The bean bags were made from black and white checkered fabric. This was done by cutting two 5-inch squares for each bag. With right sides together, stitch the sides leaving an opening to fill the bag. Turn the bag right side out gently pushing out the corners. Using a funnel, fill with corn or dried beans. Close the opening and your bean bag is game ready. Faster than fast, quicker than quick, create a race track from a pool noodle. With the drop of the green flag, guests roll cars down the noodle to the finish line. 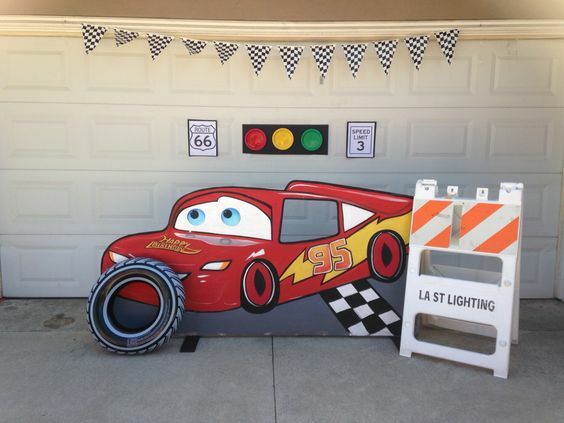 What better activity for a Disney Cars birthday party. Easy to assemble and suited for all ages. Using an inflatable or used tire, each member of the pit crew tries to toss bean bags into the target. Award prizes for the best aim. 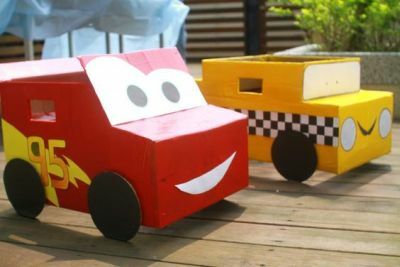 Transform cardboard boxes into Disney Cars. Little ones can compete or simply take a spin around the yard. Provide racing helmets to capture the entire racing experience. This fun game allows party guests to test their throwing skills while also learning colors. Call out the color and guests attempt to toss bean bag to the corresponding color. Keep kids entertained with a coloring station. Print out coloring pages and allow children to use their colorful imaginations with this fun activity. Prepare a kid friendly space. A table that is the right height, covered in butcher block or craft paper, with plenty of supplies that are easily accessible works best. When it's clean up time, you will be glad you did. 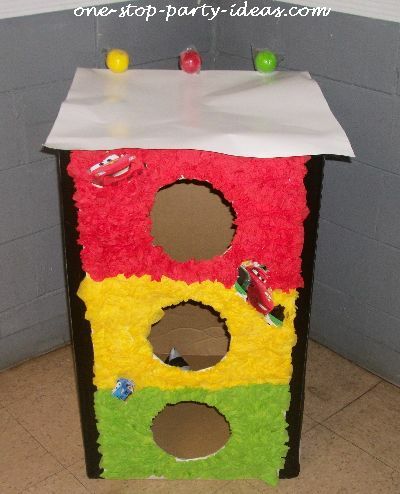 A pinata featuring Cars will be a big hit with little race fans. Fill with candy and treats to create a racing thriller. Adult supervision recommended. Sit children in a circle and instruct them to begin passing a checkered flag when the music starts (use music from the movie). When the music stops, the child holding the flag is out. This continues until the last one holding the flag is declared the winner. 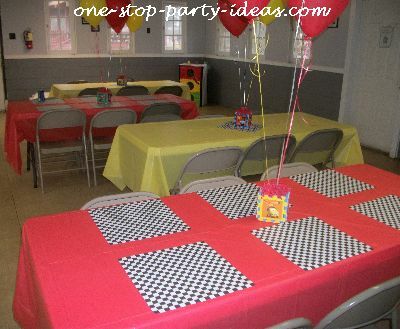 Hide checkered flags throughout the party area. The object of this activity is simply to find the hidden flag, much like a traditional Easter egg hunt. One of racing's most fun traditions is the introduction of drivers. It's particularly enjoyable for a large gathering and a great way to help kids get to know each other. 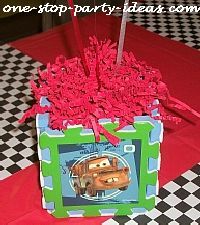 Love the idea of wrapping gifts to match the Disney Cars birthday theme. Customizing makes the wrapping as special as the gift itself. 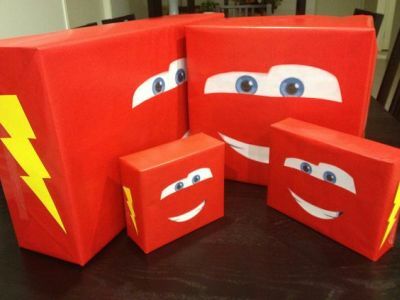 Here, red wrapping paper with familiar Lightning McQueen features and flashing yellow lightning bolts make a thrilling package. That's a wrap. Just as Mater valued his dents, we can all come to a place where we value our dents.